In past years, the presentation materials for the Revit Technology Conference were made available for download by anyone – even if you didn’t attend! If you want to quickly download all of the resources from each page, I recommend using Firefox with Downthemall. Paul Aubin has posted his RTC files for download. In this package is a ‘Detailing Sandbox’ RVT file that includes a pretty comprehensive Wall Section that is annotated using Keynotes. There is also folders with content related to Coordinates and to Finishes. I attended RTCAUS (the Revit Technology Conference Australasia) about 3 weeks ago, so I can write with a certain level of confidence in regard to the RTC 2011 team and the general level of quality of RTC speakers. Personally, I really enjoyed the experience. I found that it was inspiring, challenging, and a great opportunity to connect with the real professionals in our field. A number of the sessions will really encourage you to think outside the box, and will show what Revit is truly capable of. Perhaps you won’t instantly begin using all of these techniques, but that moment where you go “I didn’t know Revit could do that” or “I never thought of doing things that way” is something truly valuable. It will help to open your mind to future possibilities for you and your firm. 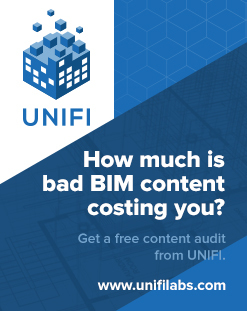 For example, I really enjoyed the sessions Designing in Revit Using Parametric Formulas and Revit’s Top Model: Conceptual Massing World – and both of these sessions are also being presented at RTCUSA. Some of the sessions will be geared towards helping you solve some of the technical issues you have been facing with Revit implementation and Revit use generally. What I really mean is that you will learn methods that you will be able to implement quite quickly, and thus you will begin to see a direct return on the investment of attending the Conference. Things like Labs sessions, Case Studies, and other sessions with a very practical focus should provide you with tips, workflows and guidance that you may have been seeking for some time. By ‘The People’ I mean persons from all of the key areas in our industry – including professionals who are using RAC, RST and RMEP on large and interesting projects. You will be able to meet key Autodesk personnel, resellers, and other people who are probably in the same boat that you are in. The benefits of such networking should not be minimized. Could it lead to a partnership that will give your firm a real edge? Will you connect with someone who will inspire you? Will it lead to a new and exciting opportunity for you and / or your firm? 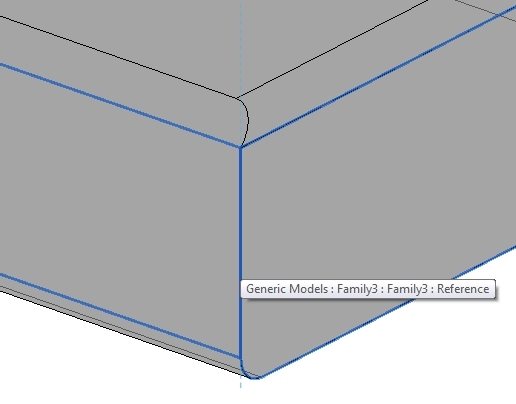 Revit 2012 gives us an opportunity to do some nice things with in-project voids. 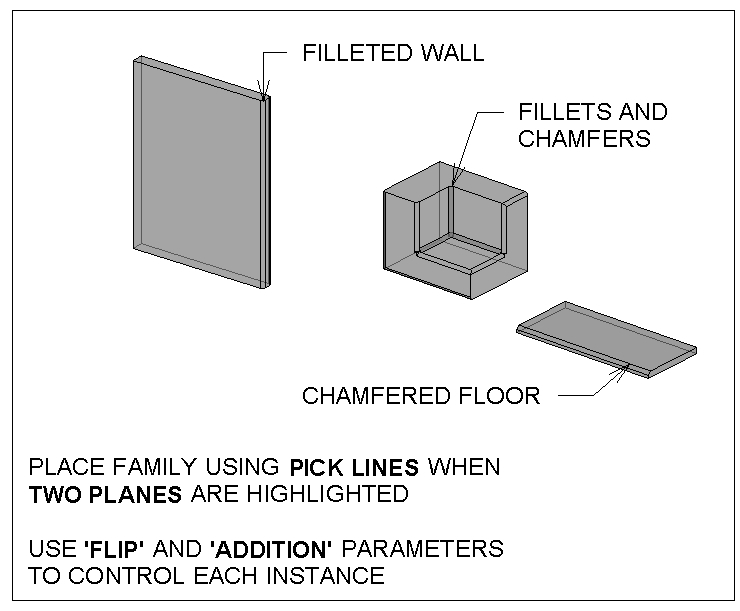 Below, you see corners of a Wall, Floor, and Generic Model being filleted and chamfered (chamfer is the word we use in Australia for a ‘diagonal’ or triangular fillet). I then load these into a project. When placing these families in 3D, if you place them when two perpendicular planes are highlighted at the same time, you get some nice control. If you do this, Revit places the item ‘on’ one plane, and ‘aligned’ to the other plane. These families can do two things to the edge – cut a void, or add a fillet. You use the ‘Flip’ Yes / No parameter to get it in the right spot, and the ‘addition’ Yes / No parameter to choose if you want the item to show the ‘fillet’ solid part. Feel free to download the example and have a play with it. Sure, there are some limitations to this method, but some of you may find it useful. It is smaller than Autodesk University and has a much more intimate feel, but it is every bit as informative… The RTC committee pays attention to many small details which give the conference a very personal feel. …in just four short weeks I get to participate again; this time in RTC USA! If you haven’t signed up yet, please consider coming out to Huntington Beach, CA this June for an information packed three days with many of the industry’s best known Revit experts. definately a morning of advanced revit geekiness! Phil Read has been the highlight so far. I learnt more awesome ‘tricks’ (sorry Phil) in 1 hour in his advanced geometry session than I have in years . Dont miss out on RTC USA! A demonstration on the mind boggling task of using Parametric Formulas in families AND ensuring it works! Amongst other topics, this session will look at space planning & iterative facade design (without relying on API), as well as more simple regulation compliance. It will include practical use of several new Revit 2012 features, including the changes to parameters, formulas & adaptive components. This example is shows using adaptive components (new Revit 2012 feature) and the “Reactor Pattern” principle to examine facade design. Finding the right solution to a problem is something that Arup as a firm has prided itself on for many years. This is no different when it comes to software interoperability between Revit and other platforms. As a firm believer that choosing the right tool for the job is key to delivering a successful project this presentation will give you an overview on how Arup applies varying techniques to sharing data across multiple platforms and multiple disciplines. This class will look beyond the singular building and look at how to use Revit to design Masterplans, It will cover how to get the most out of your modelling, to generate quick schemes that can be manipulated easily, and how this information is best presented to clients. Learn how to make use of smart geometry, define an area and let equations do the work for you. This presentation will demonstrate some of the specific tasks for which Revit was used including: use of the building model for sunshading analysis, heating and cooling loads, design checking schedules with conditional formatiting used to size and balance air terminals and flex ducts, use of area schedules for checking actual versus briefed areas, scheduling of fixtures, furniture and finishes. The presentation will also discuss project setup and standards, challenges and benefits of working within an integrated model plus a look into moving the model into a 4D environment. RTC USA is also coming up fast! It will run from Thursday – Saturday, 23 – 25 June 2011. If you want to keep up with latest trends and best practices associated with Revit, you should seriously consider attending. 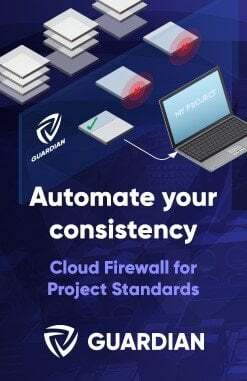 Revit Protocols & Standards – Where Do I Start? Pretty cool that I get to see Steve Stafford, Phil Read and Paul Aubin all in one day!